Over the past nine years, one of the great mysteries in heavy metal has been the strange and abrupt disappearance of German tech-death pioneers Necrophagist. In 2004, they released the remarkably complex album “Epitaph” to universal acclaim. Then, at the height of their popularity, they disappeared. There were random, unconfirmed sightings of them at concerts and even a band that claimed to be them who performed several shows in Europe in the late 2000s, but the earth had seemingly swallowed up the real Necrophagist. Concerned that a technical death metal band could have been kidnapped and held hostage in the basement of his neighbor’s house, he burst through the front door and freed Muhammad Suicmez and the rest of the band members from the dungeon that had been constructed in the basement. Suicmez had been bound, gagged and forced to play arpeggios for weeks on end with no food or water. 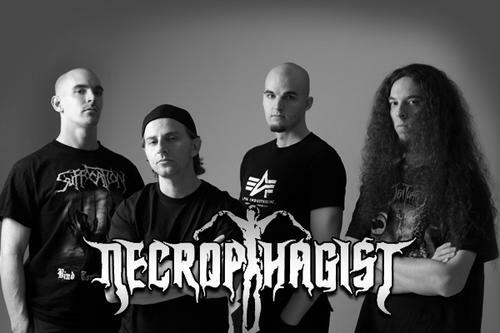 Now that Necrophagist is free, they are hard at work on a new record. They plan to spend the next five years tuning their instruments in order to ready themselves to begin the long, arduous process of songwriting. After that, they have secured ten years worth of studio time in order to allow Suicmez to work on the solo for the first song. Finally, the band will start recording, a process that should take upwards of 25 years. The band has assured its fans that they will have something out by 2057 or 2132 at the absolute latest. This entry was posted on May 9, 2013, 11:21 AM and is filed under General Weirdness. You can follow any responses to this entry through RSS 2.0. You can leave a response, or trackback from your own site. They are gonna title the album “Dead Giveaway”, amirite?? English won’t be a language anymore by the time the new record comes out. You can’t even last one week without water. Exactly, YOU or any other human can’t. They didn’t make her play arpeggios or anything, right? You’d have a pretty good lawsuit in that case. I see nothing gets past you, you’re very astute. You sure it was Cleveland? The wife and I were driving past an Amish farm, and heard some strange, semi-musical sounds coming from the barn. The father told us he had found an iPod in his daughter’s room and was running it through their thresher, but i could’ve swore I heard a little feedback coming from the horse harnesses…. the other explanation is that Suicmez is a actually a 100 years old vampire, and in vampire years 10 years are like yesterday, meaning this torturous wait is just the start! seriously now the guy is so freaki’ lazy I wouldn’t be surprised if he’d turn into a an actual sloth. a guitar playin’ sloth with useless fingers, that’s his punishment!! Was there a gammadion, ‪borjgali‬ or fylfot anywhere in the room in which there were imprisoned? If so, the presence of such objects may explain their survival. I’m not sure if the kidnapper shopped at IKEA. Actually, I’m a complete agoraphobe. I try to avoid places where there are more than two people and bathe in Lysol on an hourly basis to avoid contamination. Thanks! Realism is a major goal we strive towards here at Tyranny. This is one of the funnier things that I’ve read lately. Patrick Mameli hiding in his case is great! 10 years of studio time for the first solo…Man, I would LOVE to hear a solo that took 10 years to create! You think you would…but I dunno. There is only so much you can do with a 227 string guitar.